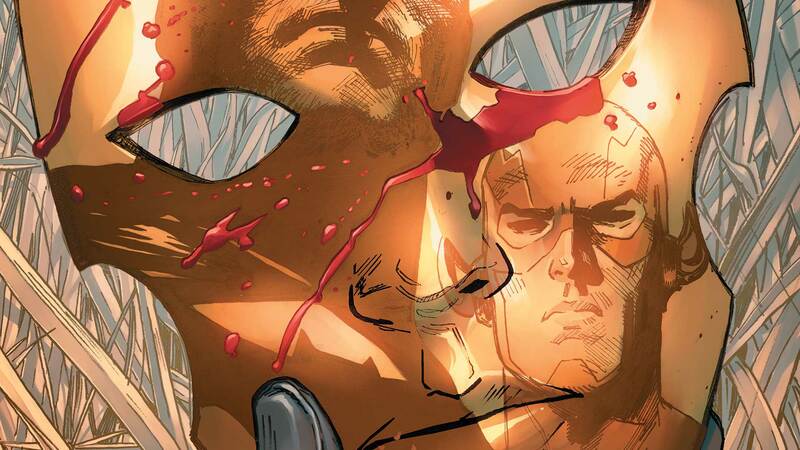 HEROES IN CRISIS is a miniseries that asks an essential question—what is the mental toll of being a superhero? In this series of columns, Meg Downey breaks down each new issue, examining the events and themes, and discussing what it all means for our favorite heroes and villains. This month, HEROES IN CRISIS takes a closer look at some of Sanctuary's patients, and the roster of heroes who spent some time checked in and healing just keeps growing. You'll recognize more than a few of them, I'm sure, but most of them are faces that haven't been around in a while, or have never really grown past C or D list ranks even when they were pretty active. For more than one hero here, this represents their first Rebirth-era appearance—and, sadly, potentially their last. The murder mystery is only getting more and more tangled up in itself as things go on, but what can we expect? We're only three issues in. That’s less than halfway. Things probably won't really start coming to light for a while now, though there are certainly some clues to be found this time around. We'll get to those in just a second. Fans of Young Justice will probably recognize this issue's star right away, but for those of us not quite so in-the-know, HEROES IN CRISIS #3 introduces La'gann. He's, well…he's the Master of the Lagoon and a former member of the almost entirely forgotten Titans East. This is the first time he's been featured in a comic in a pretty long time. In fact, La'gann's actual comic book history is so sparse, he doesn't even have a proper origin story or background. The bulk of La’gann’s characterization all happened in the Young Justice cartoon where he (don't worry) is still happily alive. Joining La'gann in the First (or Close to First) Rebirth Appearance Club are a couple other ex-Titans: Red Devil (formerly Kid Devil), who you can find as a fairly core member of the post-INFINITE CRISIS incarnation of the team. There’s also Solstice, Protector, Tattooed Man and Gnaark, all of whom enjoyed a few brief spotlight-adjacent moments prior to Rebirth. Nemesis was, once upon a time, a member of the JSA, along with the person who may or may not be Jakeem Thunder, seen lying presumably dead on the lawn. Similarly, Wally's children, Jai and Iris, haven't properly been reintroduced into the Rebirth world, but they are a huge component of what sent Wally to Sanctuary to begin with. If you’re looking for some background on that, check out the “Flash War” story arc over in the main Flash title—it’s what set up Wally’s arrival at Sanctuary. For now, though, the long and the short of it has to do with Wally's ability to remember the world from before FLASHPOINT, as well as a handful of ill-fated time-travel jaunts that left him with some knowledge he probably would have been better off never gaining. Now for some of the more familiar faces. This is the first time we've actually been given a look at just what the Sanctuary experience is. Or, more specifically, how heroes like Booster Gold were using their Sanctuary treatment. It's not a lot to work from, but there might be a couple of clues here—namely, there were two Boosters "active" at the time of the attack. One was, of course, a hologram, but still. Part of the mystery as it stands right now revolves around both Booster and Harley believing they saw the other committing the murders, and now we know that Booster was effectively fighting himself at the time everything began to go south. We don't really know enough about how Sanctuary works or just what the safety protocols were (though, being Batman designed, we have to assume they were extensive), but it's entirely possible that the attack was from an outside source and was more technological in nature than it was physical. I'm not saying that Booster's hologram self went haywire and started killing people, but I'm not not saying that. And in that same vein, who's to say Harley wasn't undergoing a similar brand of therapy for herself? It sounds a little crazy, but it's not off the table just yet. What if Booster and Harley really did see each other killing their fellow patients, but what they were seeing wasn't actually real? After all, it certainly looked like Harley killed Wally West at the end of this issue. What if somehow the holograms were the killers? What in Sanctuary was actually real at the time of the attack? Was anything? HEROES IN CRISIS #3 by Tom King, Lee Weeks, Clay Mann and Tomeu Morey is now available in print and as a digital download.